Home > PiMBEEB-A-LOOZA Statistics That Will Blow Your Mind! Frankly, the only comparable situation I can recall is the bottom of the Cartel-orchestrated paper plunge at the commencement of the 2008 crisis – which has an “asterisk” next to it, given that physical premiums surged to roughly 30% in gold, and 100% in silver. Only this time, supply on the retail level is readily available, and premiums historically low; as opposed to the worldwide wholesale market, where supplies have never been tighter . In other words, the historic Precious Metal valuation anomalies  currently seen in the West; which I personally have been taking advantage of – particularly in the gold numismatic market, where prices of century-old certified coins  have fallen to barely above the levels of newly minted ones; are decidedly not available in the East. And likely, won’t be in the West for very much longer. Since Election Day, the level of global market manipulation has stair-stepped several rungs higher, to the point that nothing I have witnessed in my 15 years in the Precious Metal markets – and 28 in financial markets in general – holds a candle to it. Clearly, I was right in predicting a Trump victory would be the equivalent of a “BrExit times ten” – as if it weren’t for such unprecedented, 24/7 manipulation, financial markets would have dramatically crashed already – just like the economies underlying them, as we speak. In other words, just as “Trump-flation” was dead on arrival, Euro-flation, Sino-flation, Nippon-flation, and all other attempts to revive history’s most oversupplied, over indebted, distorted, decayed, and dying economy are falling flat on their face; with each passing day, making it more patently obvious that today’s government-supported stock and bond markets are sporting dotcom valuations in a Great Depression Era ; as opposed to government-suppressed gold and silver, which feature Great Depression valuations in what should – and inevitably, will – be a “dotcom” Precious Metal Era. Aside from the economics yielding a hard floor on Precious Metal prices  – such as surging demand  and plunging production  – news flow has not been this PM-bullish since the bottom of the 2008 crisis. Only this time, gold and silver markets are a lot tighter; and Central banks have used most, if not all of their ammo to delay the inevitable. Better put, I cannot recall so many PiMBEEB, or Precious Metal bullish, everything-else-bearish items – both actual and potential – in my entire 15-year Precious Metal stint. Which sadly – or happily, for the small handful of Precious Metal owners – will only get worse, as history’s largest, most destructive fiat Ponzi scheme races through its malignant terminal phase. To that end, the Miles Franklin Blog works tirelessly to bring it to you, each and every day; which hopefully, you can capitalize on to both protect your portfolio from what’s coming (hyper-inflation), and profit in the interim. Speaking of Election Day, and the “Trump-flation” hopes “miraculously” spawned mere hours after its “shocking” result; as of today, it’s official…that there’s not a chance in hell Obamacare will ever be repealed – let alone, replaced with anything better. In other words, as I have been saying for years, we will shortly be the Socialist States of America – featuring Europe-like 50% tax rates, unprecedented economic stagnation, and parabolic debt accumulation. Which is why, as I reiterated again on Friday , rates will never be “allowed” to rise, no matter how high the cost of living soars. NO ONE has spent more time describing the fraud that is the now eight-month old OPEC “production cut”; which clearly, was coddled together by an ad hoc “oil PPT” to preserve the dying Petrodollar status, given just how close Saudi Arabia – America’s only Middle Eastern ally – is to the financial collapse . Friday’s news that Saudi itself has been cheating; coupled with yesterday’s news that U.S. shale production hit a new record high; and today’s, that OPEC participant Ecuador is backing out of the agreement due to financial difficulties; shows just how close the world’s most indebted industry is to collapse. Speaking of bursting bubbles – particularly those fueled by laundered Chinese capital , which the Chinese government is now cracking down en masse; we learned yesterday that Canadian home sales plunged year-over-year in June by…wait for it…25%, including a whopping 38% in Toronto. 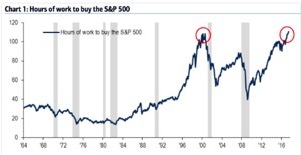 “Thank God” the Fed has suppressed the rates corporations borrow at to essentially zero – whilst providing the “put” that has caused investors to pay historically high prices for historically weak credits. As without it, the corporate buybacks that have sustained America’s most egregious equity bubble  – whilst destroying said corporations in the process, and enriching the “1%” management and shareholders – could never have occurred. A policy that, clearly, the Fed will continue “to infinity”; as we learned last week, when the fraudulent “tightening” meme died on Capitol Hill, when Whirlybird Janet shocked the world – including me – in stating that interest rates have already essentially reached the “normalized” level – of 1%! I mean, what part of the title of last week’s Audioblog, “ding dong, the Fed – and Precious Metal ‘bear market’ – is dead ” doesn’t make this more clear? Keep in mind, this is just 24 hours’ worth of PiMBEEB headlines, charts, and stats – in an increasingly PiMBEEB world, that in contrast, will appear “gold-bearish” compared to what’s coming in the next 12 months. In other words, the path to economic collapse, unfettered money printing, and draconian government actions has never been clearer – at a time when history’s best means of PROTECTING yourself from such events; i.e., physical gold and silver; have never been so underpriced . If you have an interest in buying, selling, or storing  Precious Metals, we humbly ask you to call Miles Franklin at 800-822-8080, and give us a chance to earn your business.